Earls Court Motor Show and Commercial Motor Show memorabilia. Homepage. This page: Original labels (or stamps) for the International Motor Show at Earls Court, either side of WW2. Earls Court Motor Show collectables. This page in the collectables section will contain bits and bobs that relate to British motor shows, of both the pre-war and post-war eras. To begin with, is this assortment of small gummed labels, or stamps, each of which relates to a particular motor show. My guess is that the labels were distributed to upcoming exhibitors, in order that they could promote their attendance to both their customers and suppliers alike. The majority refer to the motor show that was due to be held next, although there is no suggestion of date on either the oldest-looking label, or those which are from the early 1960s. The first post-war International Motor Exhibition was held at Earls Court between October 27th and November 6th 1948. No motor show took place in 1946 or 1947, and the 1948 event, the 33rd Exhibition, was that which had been due to take place late in 1939. This therefore helps to date a few of the labels shown below. These are not shown in date order! The earliest in this set is the sepia-coloured label, dated October 14th - 23rd, which incorporates an artist's rendition of the Earls Court building. Research of old motor show dates confirms this label as being for the 1937 show, the first to be held at Earls Court. Prior to 1937, the show had been held at Olympia, a venue used for this event since 1905. The next oldest is the 32nd International Motor Exhibition, which features a blonde bombshell behind the wheel of a tourer, promoting the 1938 event. The labels then move to the post-war years, the first label I have for this period being for the 35th motor exhibition, held between October 17th - 27th 1951. There are then labels for the 1952 (37th), 1953 (38th), 1954 (39th), 1955 (40th), then 1960 (45th), 1961 (46th), and two for different companies exhibiting at the 1963 (48th) motor show. There are three original labels for the Commercial Motor Show held at Earls Court in London, also referred to as the International Motor Transport Exhibition. The earliest, featuring a driver behind the wheel of his lorry looking out at Earls Court, dates to 1937 (the 15th commercial motor exhibition). The next label is for the 17th show, held in 1949, followed by the 18th in 1950. Scottish Motor Show at Kelvin Hall. 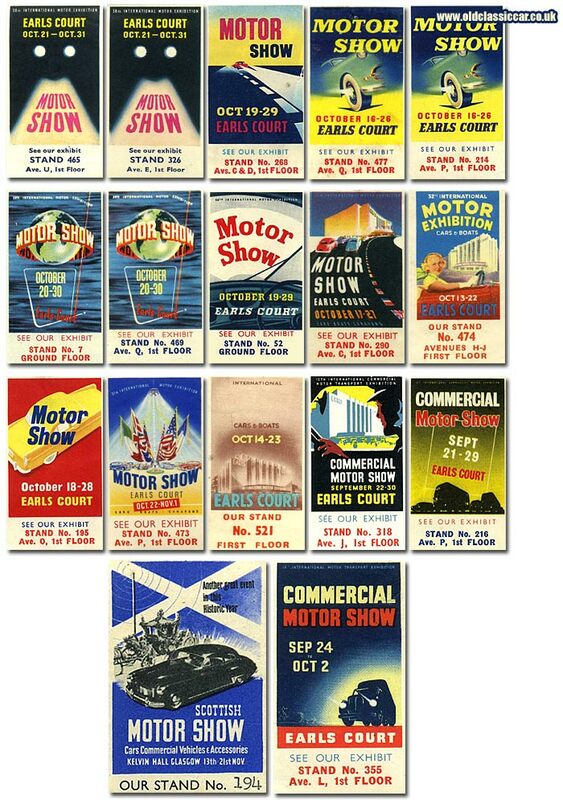 The odd-one-out in this collection is the Scottish Motor Show label/stamp, for cars, commercial vehicles and accessories, due to be held at the Kelvin Hall in Glasgow, between 13th - 21st November. I haven't yet found a date for this particular show label - but it must be early 1950s by the looks of it. Interestingly, until early in 2010, the Glasgow Museum of Transport could be found within Kelvin Hall, after which it re-located to new premises. More motor-related items of paperwork can be found in Motoring Collectables section of the site. Additional items, specifically referring to the early motor shows, will be added in here soon.